Step training has recently been shown effective in preventing falls most likely because of its high task-specificity to rapid movements required to avoid falls. Step training systems using interactive video game technology have the potential for widespread implementation because they are low-cost and can be used unsupervised by older people at home. While this is all very promising, there is one thing we need to consider. Most stepping systems only train in a few directions (e.g., anterior-posterior and lateral directions). This is concerning because a randomised controlled trial (RCT) showed that upper-limb resistance training with limited directions deteriorated rapid movements in untrained directions in older adults. Therefore, to ensure the safety of home-based step training system, we conducted this study to examine transfer effects of step training on stepping performance in untrained directions among older adults. We conducted an RCT with 54 older adults aged 65 years or older. The participants were randomly allocated to one of three groups; forward step training (FT), lateral plus forward step training (FLT) and no training (NT) groups. A choice stepping reaction time (SCRT) system was used for the training as well as assessments (see Figure). The FT group completed 200 forward steps, while the FLT group completed 100 forward steps and 100 lateral steps. The NT group rested for 15-min between the pre- and post-assessments. Prior to and immediately after the training or rest periods, the participants underwent a 2-min CSRT assessment. During the assessments, participants wore 14-mm diameter reflective markers to the lower limbs and their stepping movements were recorded using a 6-camera Vicon Bonita motion capture system. We used choice stepping reaction time and stepping kinematics in untrained, diagonal and lateral directions as outcome measures. Results indicated that FT induced delayed response time (a negative transfer effect) and faster peak stepping speed (a positive transfer effect) in the diagonal direction during the first step after the training. However, these effects were no longer apparent in the subsequent steps. Moreover, no such effects were seen in the FLT group. Figure. A) The step mat and screen display used in the step training and stepping performance assessments. B) A typical example of stepping trajectory for one participant. 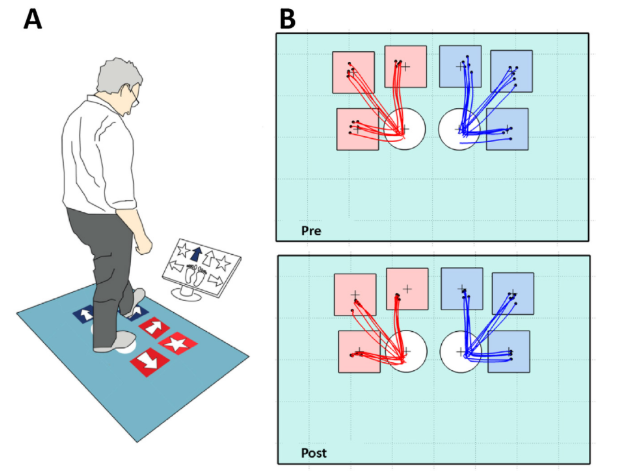 Our results suggest that if participants receive a step training program that only trains steps in the forward direction, this will improve stepping speed but may acutely slow response times in the untrained diagonal direction. However, this acute effect appears to dissipate after a few repeated steps. Step training in both forward and lateral directions appears to induce no negative transfer effects in untrained diagonal stepping. These ﬁndings suggest home-based step training systems (usually with 6 directions) present low risk of harm through negative transfer effects in untrained stepping directions. 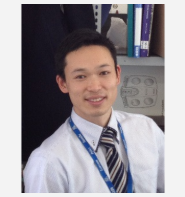 Yoshiro Okubo is a Visiting Researcher at Neuroscience Research Australia supported by the Japan Society for the Promotion of Science. He graduated in 2015 as a doctor in Sports Medicine at the University of Tsukuba (Japan). His research has enhanced the understanding of interrelationships between falls, fall-risk factors and exercise modality.